The band formed in 2008 in Kobe, Japan. 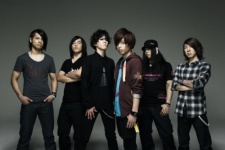 Fear, and Loathing in Las Vegas is a combination electronica and metal. The singing is comprised of twin vocals; the destructive shouts of one vocalist contrast with the Autotune of the other which gives them a presence like no other. In November 2009, their first EP, "Burn the Disco Floor with your" 2-step "!!" was released. The band represents something very different and with an average age of 19 years they show true potential.